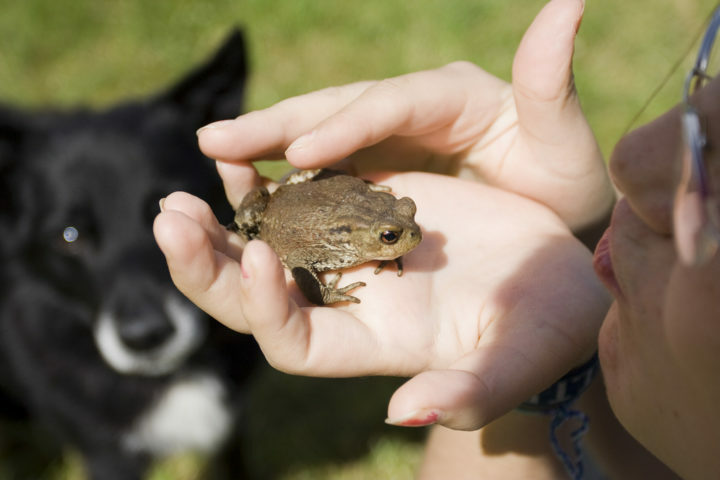 Dog Frog Poisoning Facts: It’s True, A Toad Really Can Kill A Dog! In the eyes of your dog, frogs and toads fit the bill as instant entertainment, as seen in this video. However, dog frog poisoning is something we’re starting to hear more about lately. And while it’s not frogs per se which are the problem, the fact is… not all toads are safe for your dog to play with! Do you know the difference between frogs and toads? For the most part, toads found throughout the United States are harmless little creatures that coexist nicely with other wildlife and household pets. But a few toads happen to secrete a poisonous venom that can cause serious problems for dogs. In fact, toad poisoning is one of the Top 10 pet poisoning incidents each year! Colorado River Toad – also known as the Sonoran Desert Toad, it’s mostly found in the southwestern United States (from Arizona to southern California) during the months from May to August. It averages in size from 4 to 7 inches in length. Its venom can poison a dog. Here’s what a Giant Toad sounds like. Both of these toads secret Bufotoxin from glands on their back. The Bufotoxin is a powerful hallucinogen. In fact, the venom from these 2 toads is actually powerful enough that if the toad took a dip in your dog’s water bowl, it is very likely that your dog would develop symptoms of toad poisoning. It’s worth noting that the Bufo Fowler’s Toad (also known as the Common Toad) can also cause problems for dogs. Since they’re found just about everywhere east of the Mississippi River, this is the most common toad your dog is likely to come in contact with. Although it’s smaller in size than the 2 venomous toads mentioned above, it too packs a powerful punch in the venom department! The American Toad is also dangerous to dogs if ingested. Here’s what an American Toad sounds like. Immediately flush your dog’s mouth with running water in an outward direction – so your dog doesn’t swallow the poison. Rub your dog’s gums and remove any slime or residue. Then contact your veterinarian immediately! Especially in the case of the Colorado River Toad and the Giant Toad, specialized treatment is vital to your dog’s survival. If toad poisoning is suspected, your veterinarian will most likely do an electrocardiogram in order to determine if your dog has an abnormal heartbeat or not. Since there is currently no way to find the presence of the toad toxin in dogs, diagnosis is usually based on whether the dog was seen eating a toad, or if toad parts are in the dog’s gastrointestinal tract. My Dog Caught A Bunny Rabbit, What Should I Do?